There are days I love being in the kitchen, and there are some days that I just hate it. I don't know why, I guess everyone has their moments. On days like that I'm always looking for easy meals to get me in and out of the kitchen rather quickly. Lasagna is one of my favorite comfort foods, but it can be very time consuming to prepare. Full on lasagna is great for the weekends, but not for a busy weeknight meal. Today I want to share an easy alternative to regular lasagna. 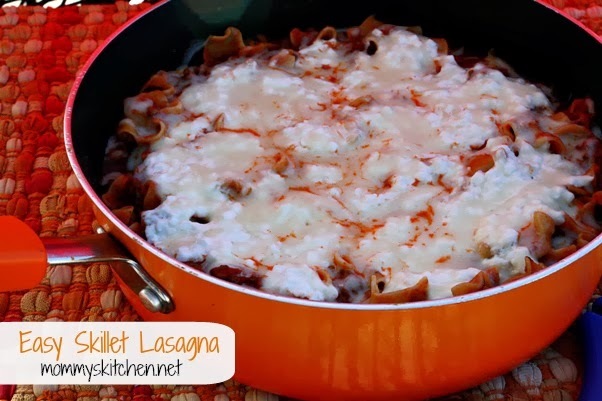 I was poking around on the Pillsbury page and came across this recipe for Skillet Lasagna. This easy skillet meal that has all the classic lasagna ingredients with lots of cheesy goodness. 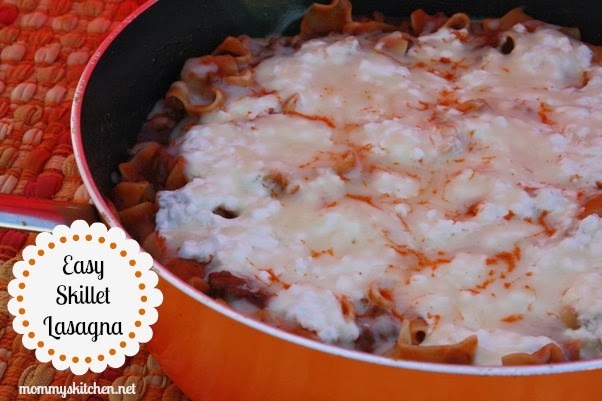 It reminds me of Hamburger Helper Lasagna, but better. Lasagna Helper is one of my daughter's favorite so she loved this meal. From start to finish this dish took literally 30 minutes to make. Pair it with a vegetable, salad and rolls for a quick and comforting weeknight meal. I'm betting you already have everything in your pantry to make this, so I hope you'll give it a try. In a 12 inch skillet, cook ground beef, Italian sausage, onion, and garlic over medium heat until beef is thoroughly cooked and the onions are translucent, stirring frequently. Drain off any grease and return meat to the skillet. Add the spaghetti sauce, water and noodles. Mix well and bring to a boil. Reduce the heat to medium-low. Cover and cook for 15 to 17 minutes or until noodles are tender and the liquid is mostly absorbed. In a med-large bowl, combine cottage cheese, cream cheese, 1/2 cup five cheese blend, and parsley flakes if using. Mix well. Spoon cottage cheese mixture evenly over cooked beef and noodles. Sprinkle with the remaining Italian cheese blend. Cover and cook for 5 to 7 minutes or until cheese is melted. Here are a few step by step recipes. To start cook and brown the ground beef , sausage, onion and garlic. Drain off any grease and add the spaghetti sauce and water. Add the noodles and mix well. Bring mixture to a boil and then reduce heat. Simmer the mixture for 15-17 minutes or until the noodles are tender and the liquid is absorbed. Mix the cottage cheese, cream cheese and 1/2 cup of the Italian Cheese Blend together. Spoon the mixture over the noodles and cover and cook for 5-7 minutes or until the cheese melts. You can also place the skillet (make sure it is oven safe) under the broiler for about 3-4 minutes, or until the cheese is golden brown and the cottage cheese mixture it hot and creamy. Oh Tina - that dish looks sooo good. I've made something similar, but will be trying your recipe next time...and soon. I have browned burger in the freezer I need to use up. Hubby will love this one. Thanks. That sounds like a plan Marsha. Thanks for stopping by. Do you think ricotta would work in place of cottage cheese? Thanks! This is definitely something my wife will love to make. She makes lot of meals in the skillet. That includes steaks which is unusual, some how she gets it to taste pretty good. Great post and thanks for the recipe. I made this last night and it turned out really good. I've never been very good at making lasagna, but I love it so this was a easy alternative. I did glance at the Pillsbury version too. I pretty much stuck to your version, but I added back the green onion and parmesan into the cheese mixture. Just as a side note I love your site. It's given me lots of good ideas.